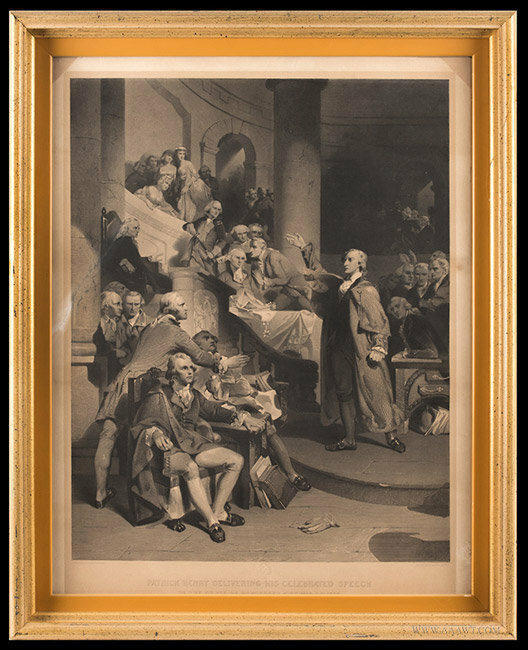 This print illustrates Naboth being falsely accused; a crowd of people are gathered listening to the announcement read from a balcony. 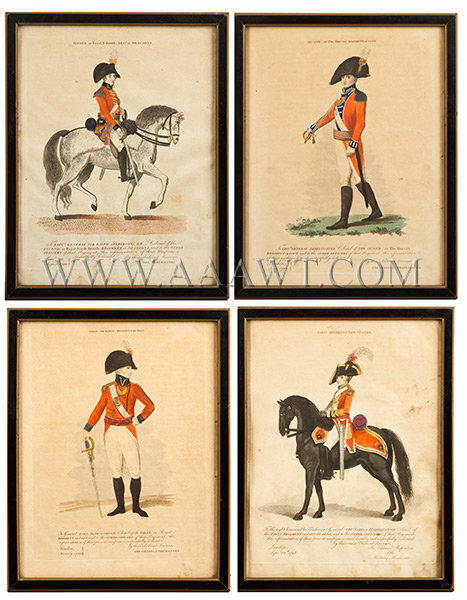 Prints from this series are within major museum collections including the British Museum and the Boston MFA. 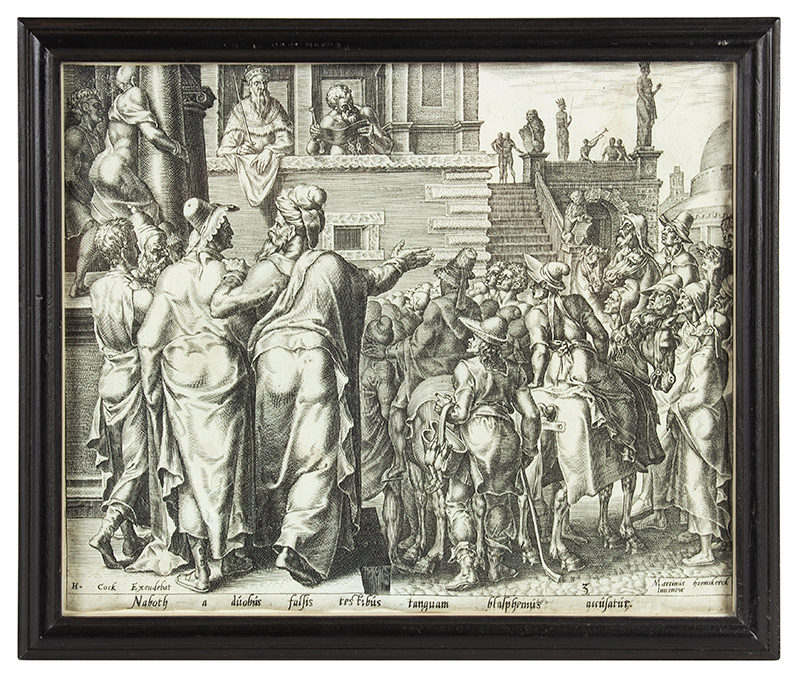 In part the paper and fine detail assign this work to the 16th century. 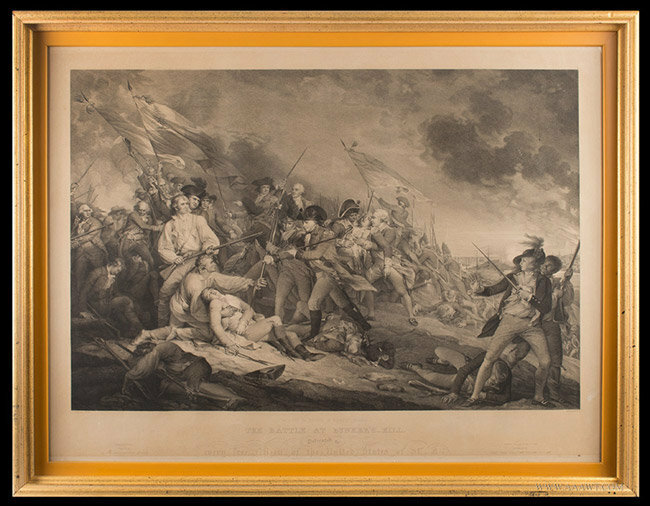 The print is in very good condition and measures approximately 8 x 10" [not removed from frame]. 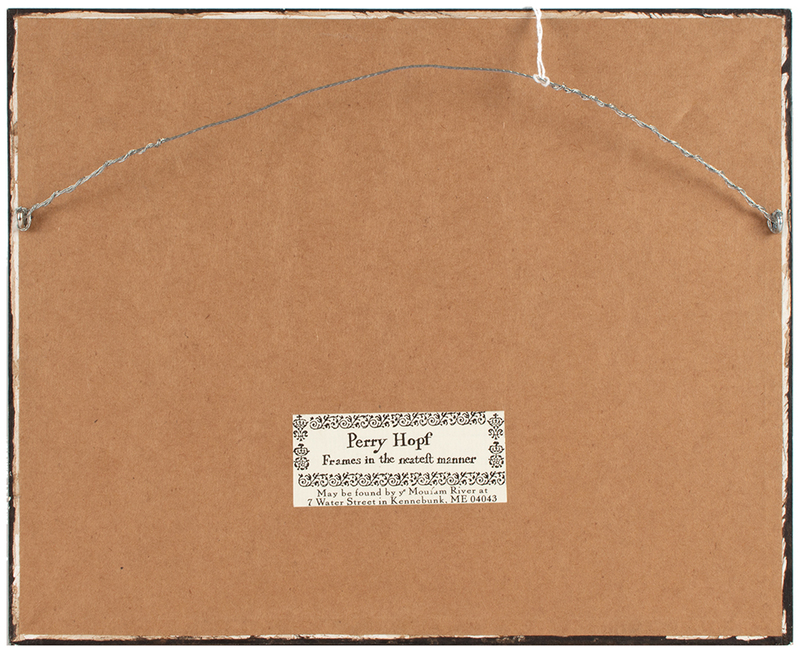 The piece has been paper conserved- cleaned and deacidified, and then framed by Perry Hopf. 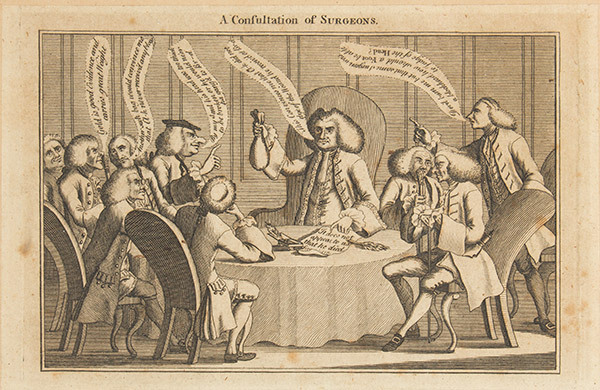 Depicted is a party of surgeons grouped about a table, under the presidency of one who holds up a large bag of money in one hand, and with the other points to a scroll inscribed: ---"It does not appear to us that he died----"; he says: ---"This (the money) Convinces me that Cl---k did not dye of the Wound he receiv'd at Br---d"..."
Johann Georg Nordheim was a prolific German engraver whose engraving of the Battle of Bunker Hill was reproduced by American publishers such as the North American Bibliographic Institution. 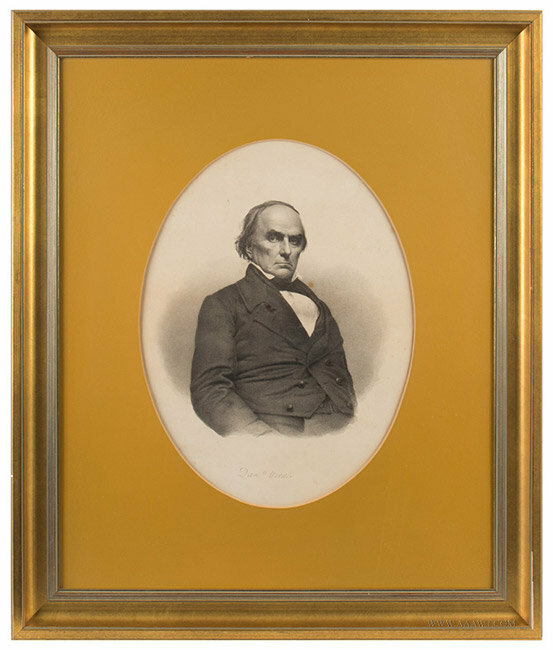 This engraving was sent to Institution subscribers, and had three format options with varying prices. 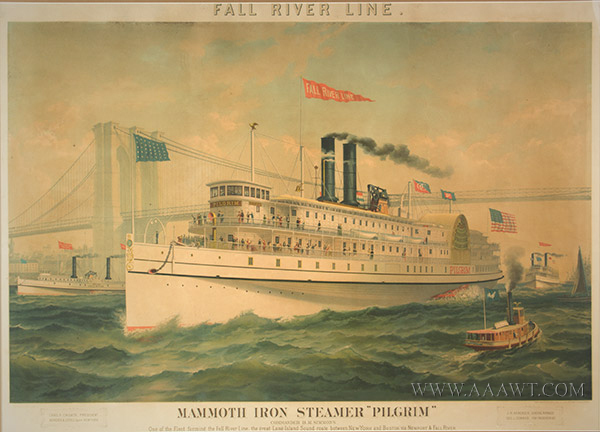 Images of events in American history were popular subjects for prints, which could be made quickly and circulated widely. 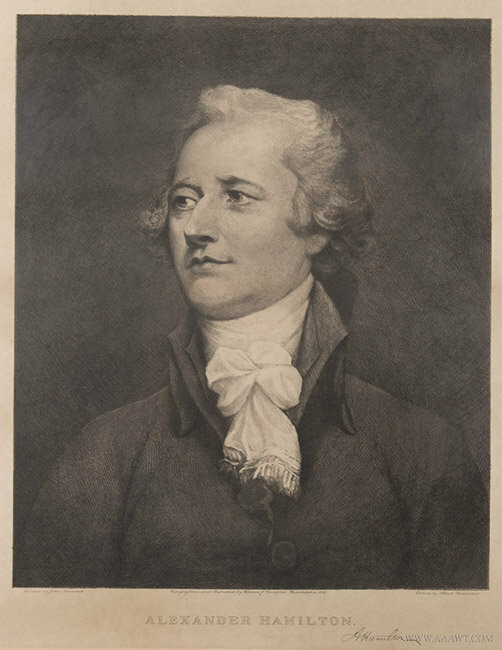 Academic institutions used prints to encourage appreciation for American art, using the medium to gain exposure to those who were unable to view the paintings in person. 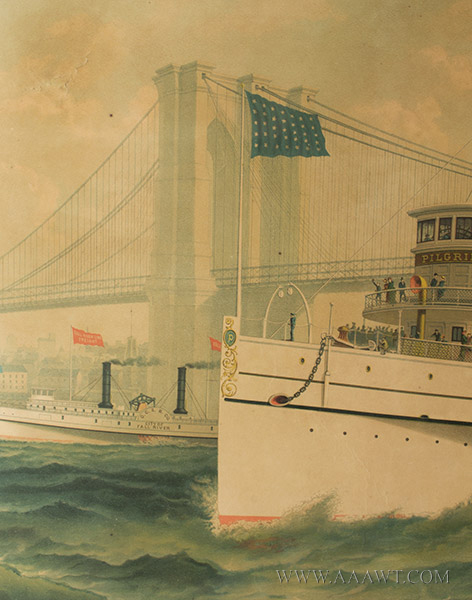 Albert Rosenthal was a prominent Philadelphia portraitist, son of the artist Max Rosenthal. He is also known for his lithographs and etchings. 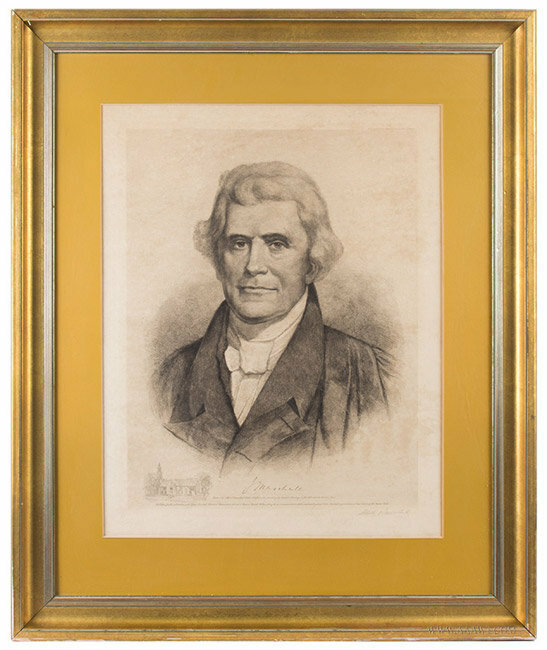 This bust etching of John Marshall is after Chester Harding’s full-length portrait at the Boston Athenaeum. 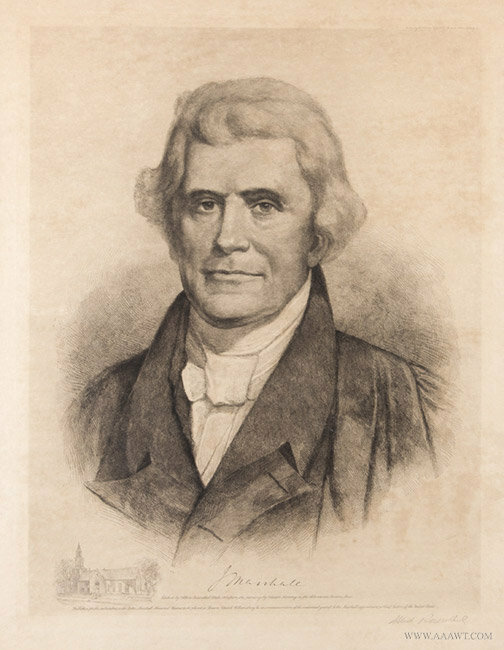 The etching was published for donors to the John Marshall Memorial Window in the Bruton Parish Church at Williamsburg, Virginia, where he was a parishioner. The church itself is pictured at the bottom left of the etching. The window was installed to mark the centennial of Marshall’s appointment as Chief Justice of the United States. 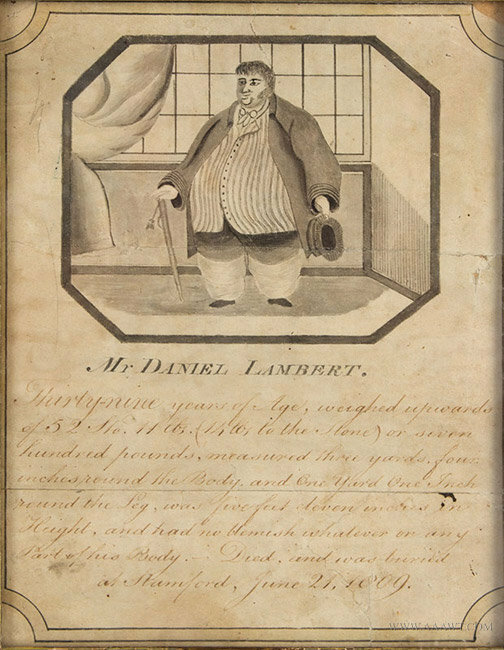 John Sartain was a prolific English engraver and printmaker, who settled in Philadelphia and was an active member of the city’s art community. 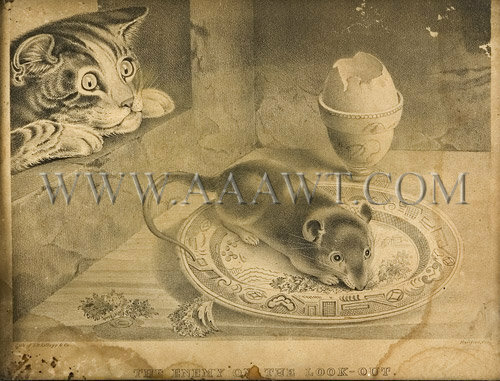 He created illustrations for his own “Sartain’s Magazine” (begin in 1848), and was the art director of the Centennial Exposition at Philadelphia in 1876. 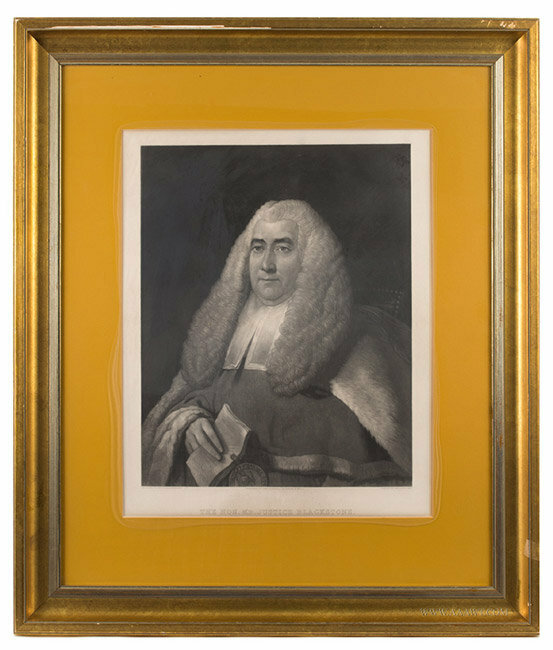 This mezzotint is after a portrait of the Honorable Sir William Blackstone in the Tate Collection. 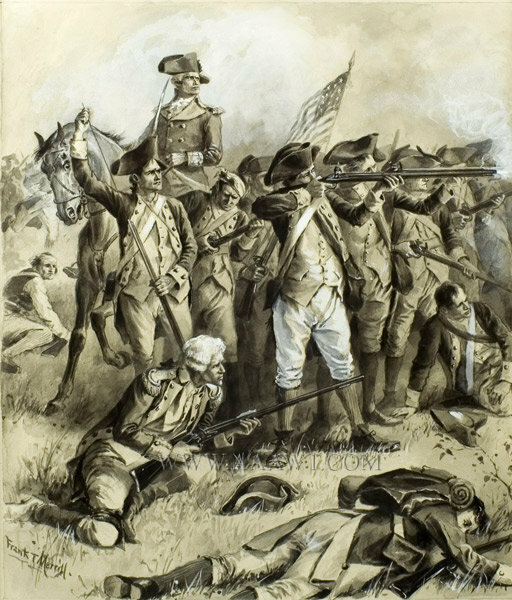 Alfred Jones was an English engraver who is best known for his illustration for the commemorative 1890 stamp of Thomas Jefferson. 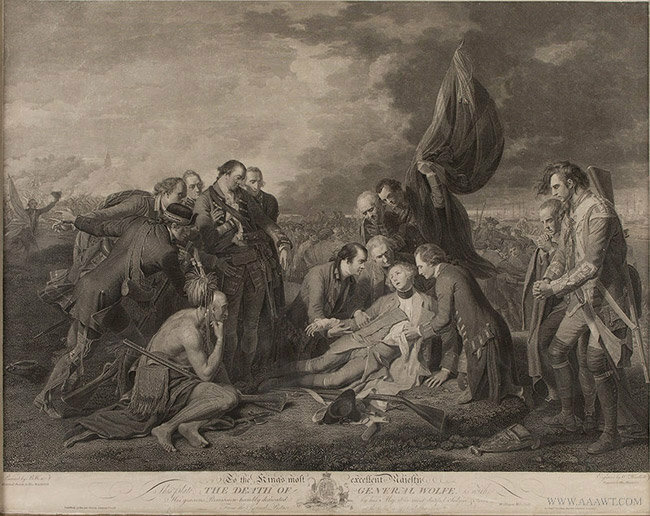 This engraving is after a painting at Red Hill, in the collection of the Patrick Henry Memorial foundation, showing Henry giving the speech in which he proclaims, “If this be treason, make the most of it.” The Art Union of Philadelphia produced prints of American historical depictions to encourage appreciation for American Art, and engravings like this would be purchased through a subscription to the Union. Print cut to fit around oval matte, customer call mark [H. Pleasanton/Call] on reverse. notice. 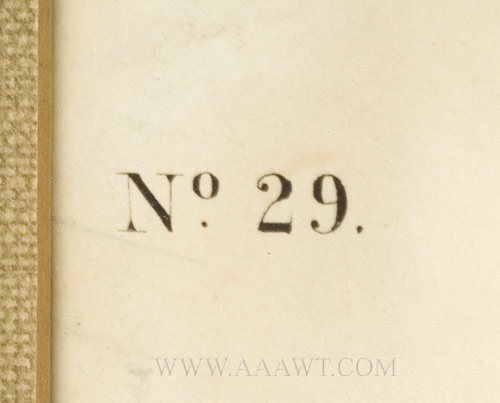 ; .Adams, Jan 12, 1837". 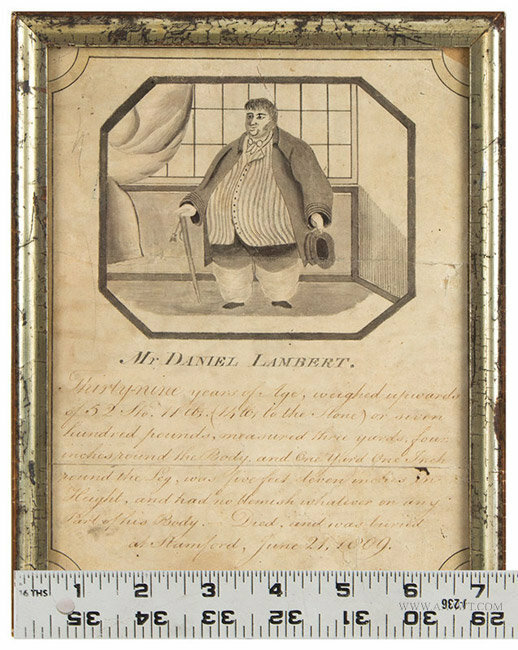 A rare and early piece of Adams, Massachusetts advertising; unique and special by any standard. 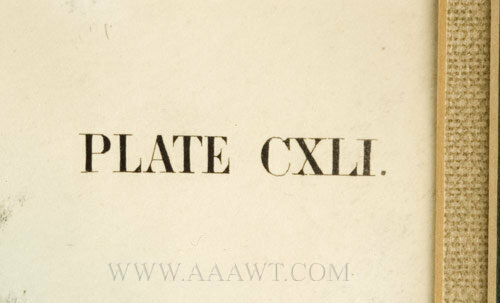 A label on reverse indicates: "This drawing and the written text was made by Charles Brown Wells (1813 to 1892) in January 1837. 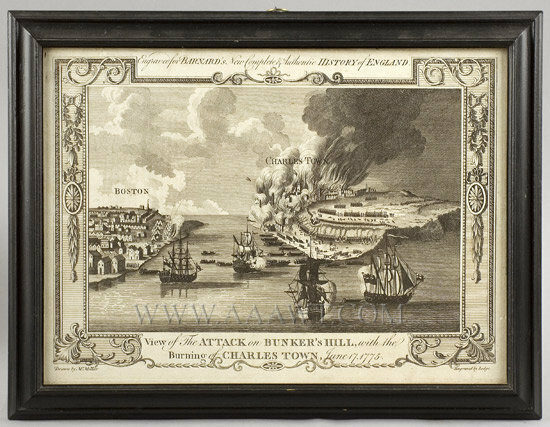 (Yet beneath the drawing is "By R. Smith, Esqr., Apparently not accurate; possibly the owner? Check out Wikipedia. This is Orson Welles' family. 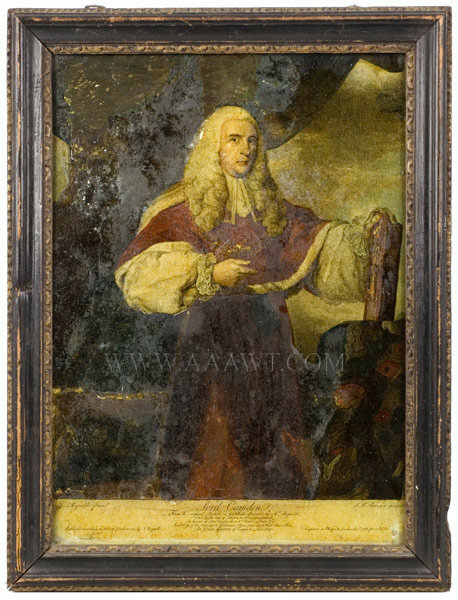 A second label reads:" Loaned by Miss Sarah Wells, North Adams, (Mass)"
Frame with very minor imperfections; mezzotint with imperfections. 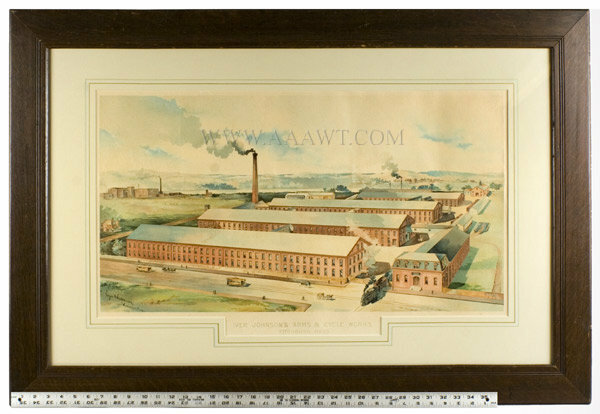 Dimensions: 16.75 by 12.75" frame, 14 by 10" sight-size. 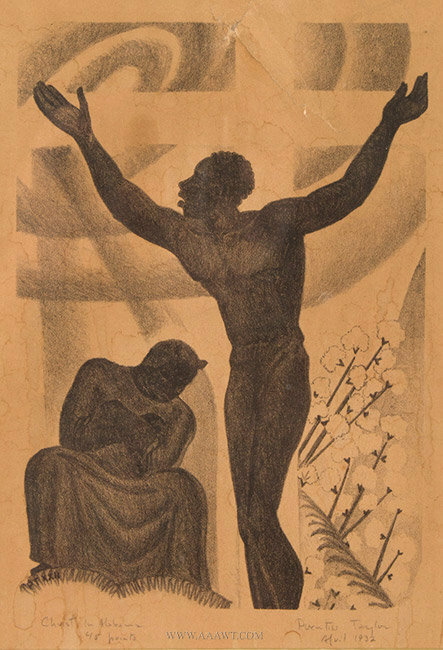 Illustration from Langston Hughes’s Scottsboro Limited, a collection of works written in response against the wrongful 1931 conviction of nine African American young men in Alabama. 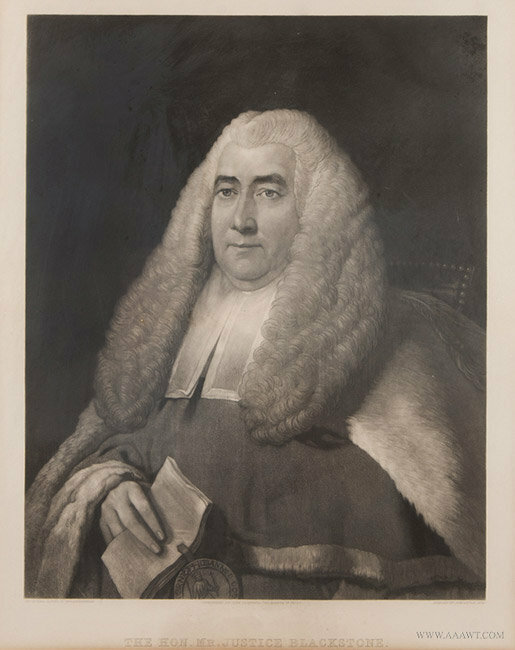 Hughes had already written the short verse play prior visiting the accused in prison, later adding four poems in the featured edition. Though their accusers confessed to fabricating the nine men’s crimes, their prosecutions endured another seven years at the state, federal, and U.S. Supreme Court levels. In 2013, all nine were posthumously exonerated by the state of Alabama. 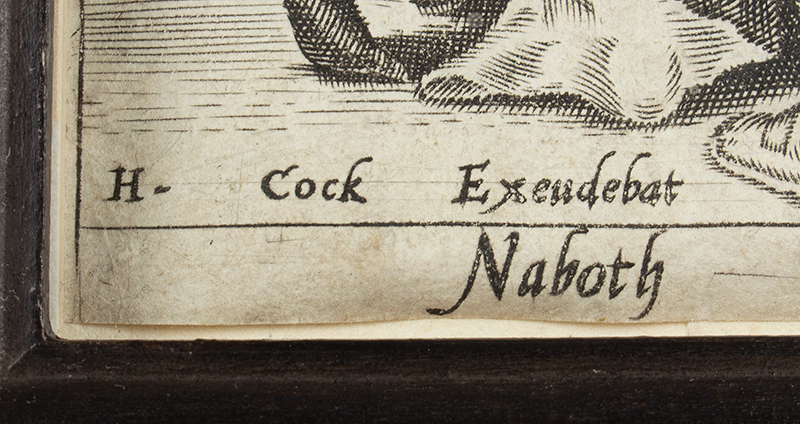 "Engraved for Barnard's New Complete and Authentic History of England." 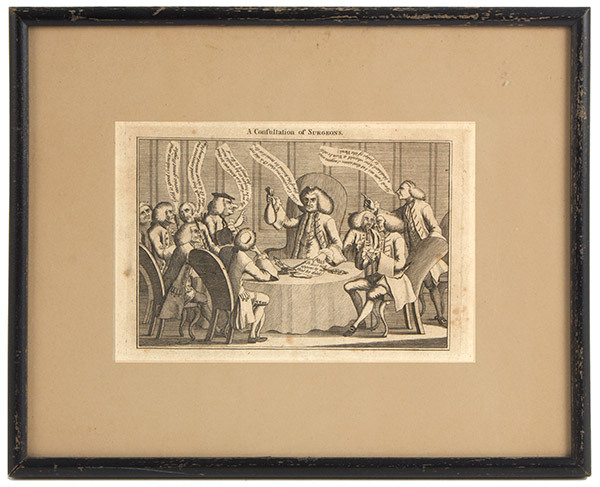 Frame: 14 by 10.5"; view: 12 by 8.5"
This is from a series of prints depicting events witnessed and recorded by English settlers during their first attempt to establish a colony North America. 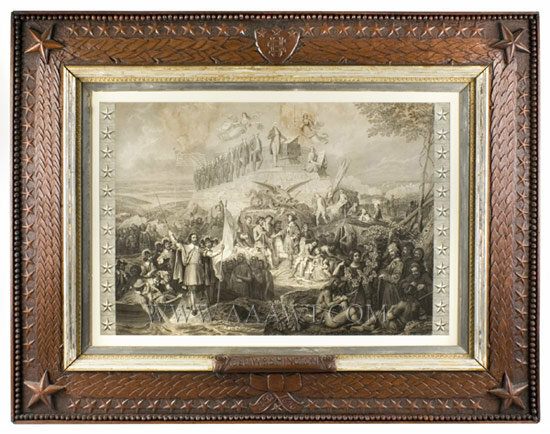 (Roanoke Colony sponsored by Sir Walter Raleigh) The image is after a painting by John White, who was sent to 'Virginia' by Raleigh to record by drawings; , the new colony. 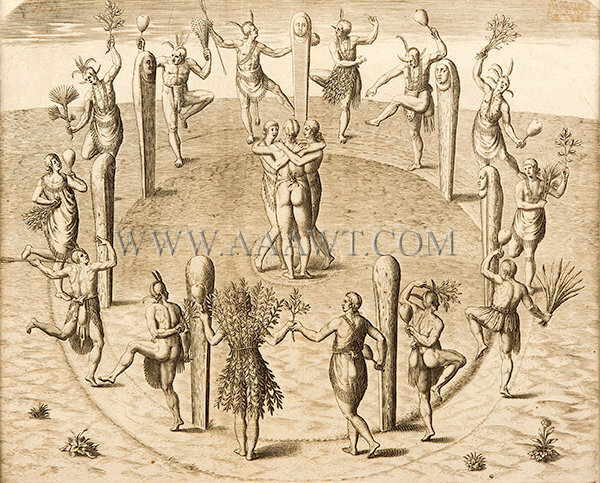 The series of images provide a real and accurate history of the Native culture in the Carolina region during the period of "first contact" by the Native peoples and Europeans. 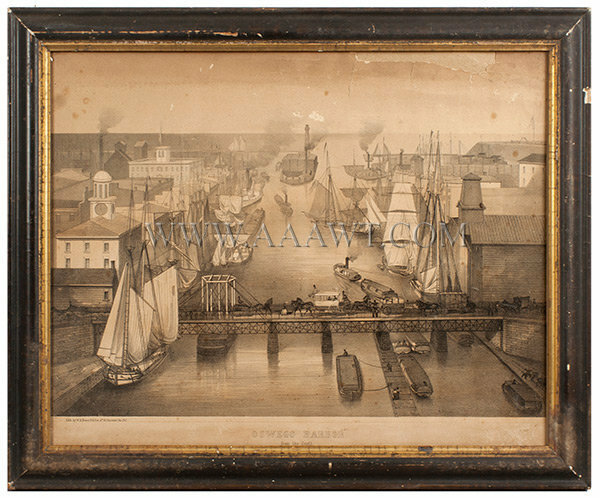 Carriages and wagons cross the bridge; canal barge towed upstream; others lie alongside the canal banks, also seen are steam tug/tow barges; schooners and brigs dry their sails. 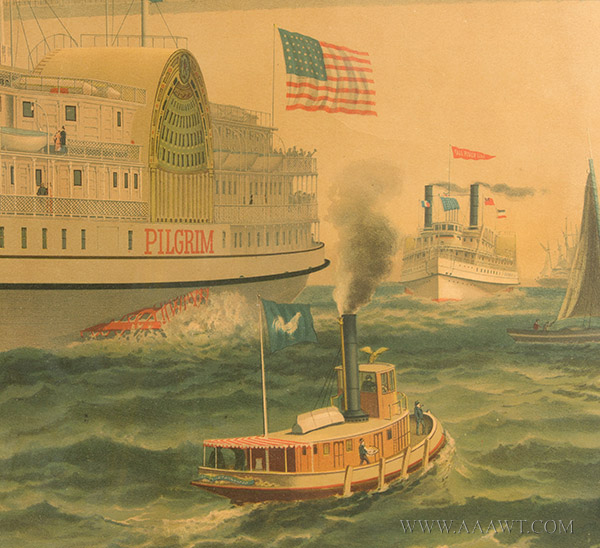 A paddle-wheeled steamboat lies at the wharf; in the distance a lighthouse is seen at the harbors mouth. Stacks of lumber can be seen all about the harbor. Paper loss at top right, toning; not examined out of frame. Dimensions: 31 by 26" frame, 24 by 19" sight-size. 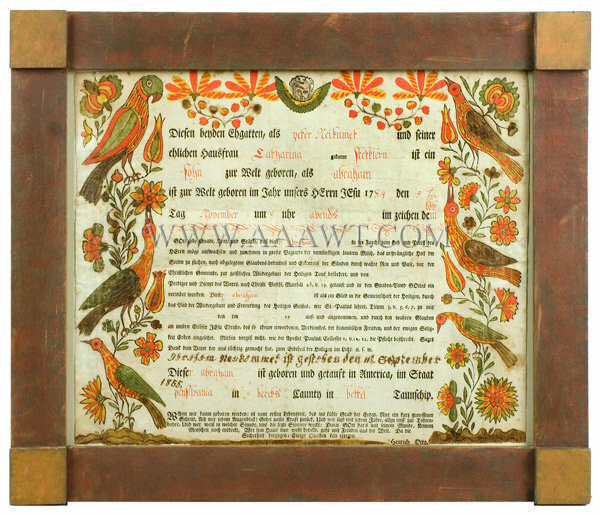 Color remains bright, folded in quarters, mounted within brown painted period frame. 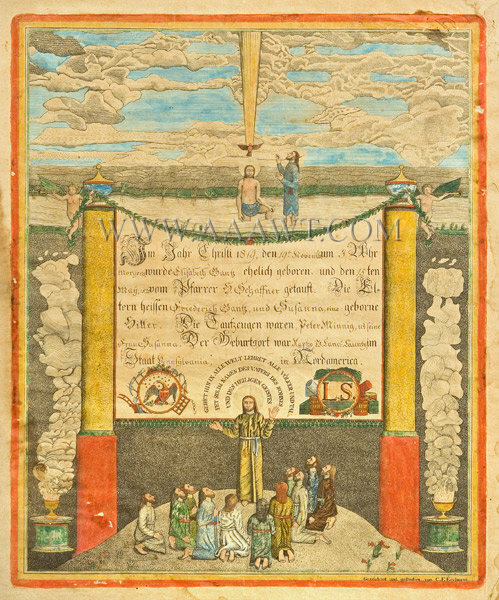 Literature: Illustrated, Plate VI, "Fraktur Writings and Illuminated Manuscripts of the PA Germans", 1961, by Donald A. Shelley. 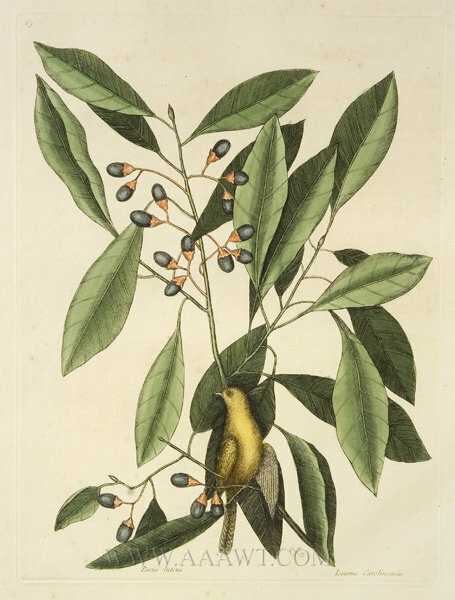 A nice image from The Natural History of Carolina, Florida and the Bahama Islands; first published 1731 - 1743 with subsequent editions in 1754, 1777, and 1800. 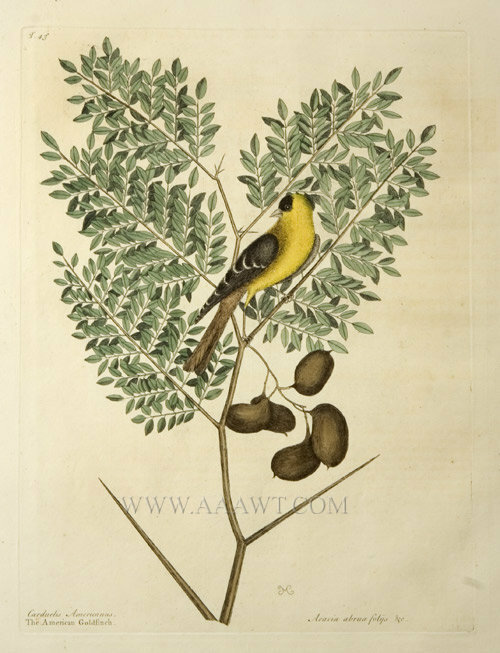 Catesby was one of the first naturalists to visit and record flora and fauna in America. Overall condition is very good with a few spots. 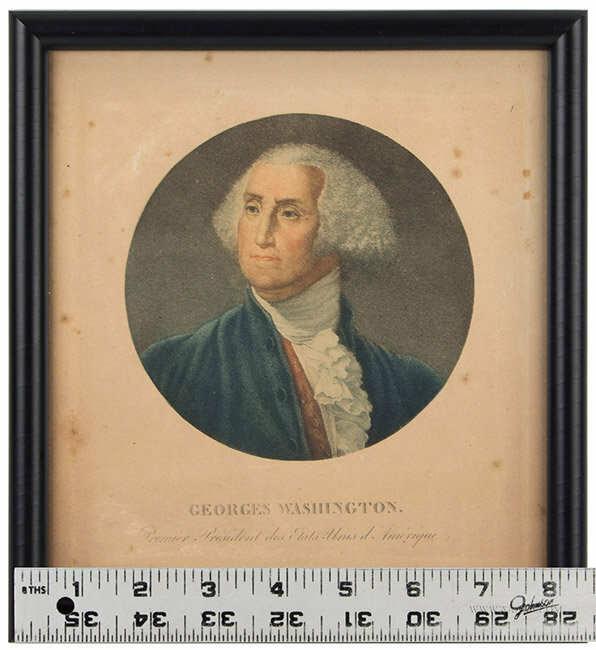 Dimensions: 15.75 by 13" frame, 11.75 by 8.75" sight size. 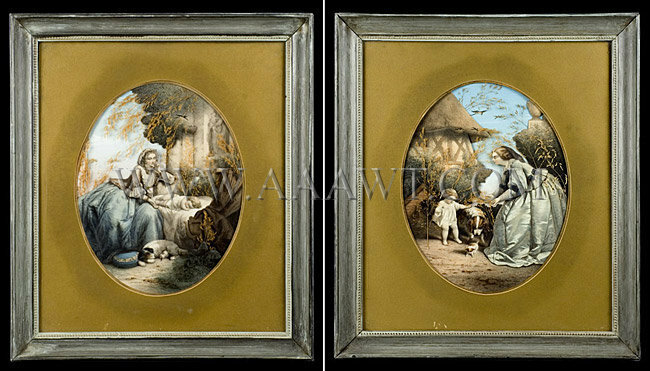 A pair of framed hand colored lithographs by Emile Pierre Desmaisons (France / 1812 -1880), cut and constructed to create a three-dimensional effect with dried grasses added to enhance the illusion, each portraying a mother and child in a bucolic setting, framed and in oval mats, very good. 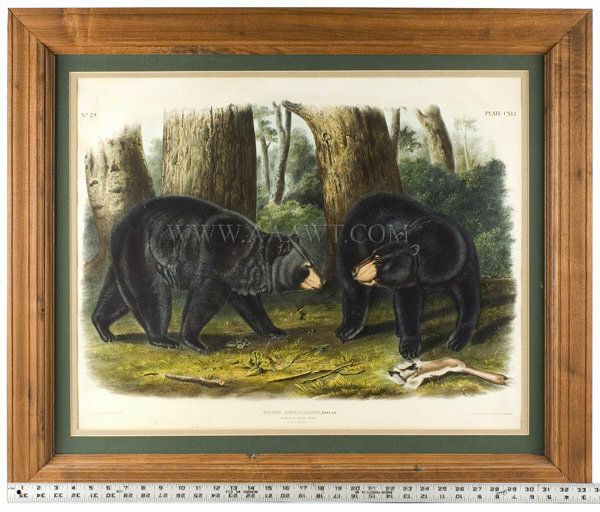 Dimensions of both: 16.5 by 18.75-inch frames, 9 by 11.5-inch sight-sizes. The artist was born in Boston on 14 December 1848, the son of George William Merrill and Sarah Rose Alden. He studied at Boston Latin, the Lowell Institute and the Boston Museum of Fine Arts; he traveled and studied in Europe and began his career as a book illustrator. He illustrated standard editions of English classics, such as Thackeray and Scott, and original works by many American authors, including Hawthorn and Twain. 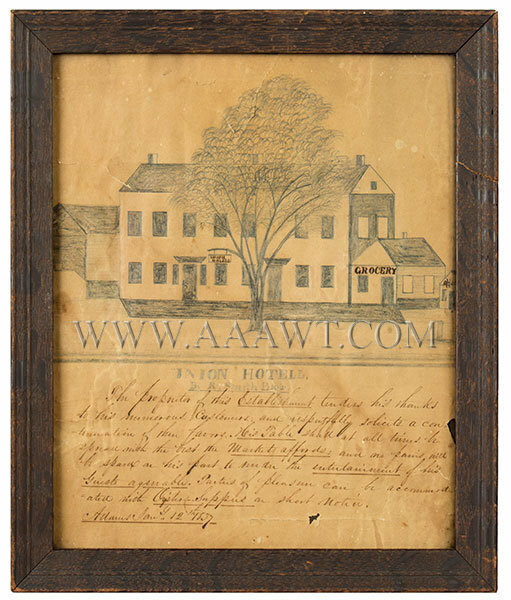 In 2002, the Concord (MA) Museum mounted an exhibition of Merrill's original sketches for the 1880 edition of Little Women and his correspondence with Louisa May Alcott. 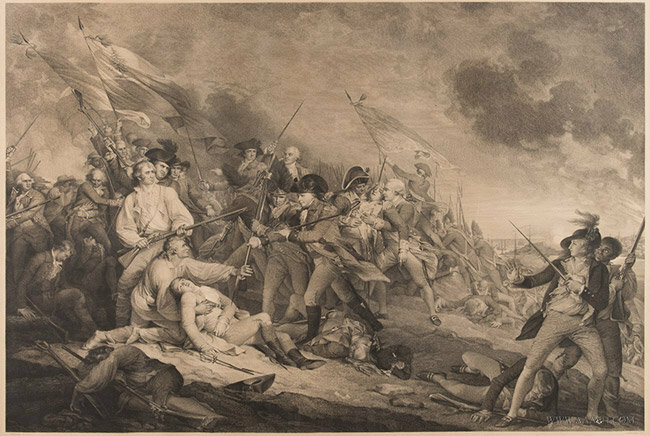 A complex and symbolic work of praise, joy and triumph that combines allegory images intended to present the glorious past of the United States. The iconography beginning in 1492 with Indians, explorers and Pilgrims; scenes from the American Revolution featuring an American eagle pouncing on the British lion and unicorn; also a depiction of vast lands, a city, a river crowded with ships of commerce and locomotives stating our prosperity all beneath a prominent American flag. The work is surmounted by a pyramid after the Acropolis displaying state shields; also shown are fifteen presidents, yet curiously, Lincoln is not present. Washington prominently holds the Constitution and covers his heart with the other hand; seated is a figure holding the Declaration of Independence; crowning this work are the goddesses of Liberty and Justice while in the vista is the capitol surmounted by our American flag. 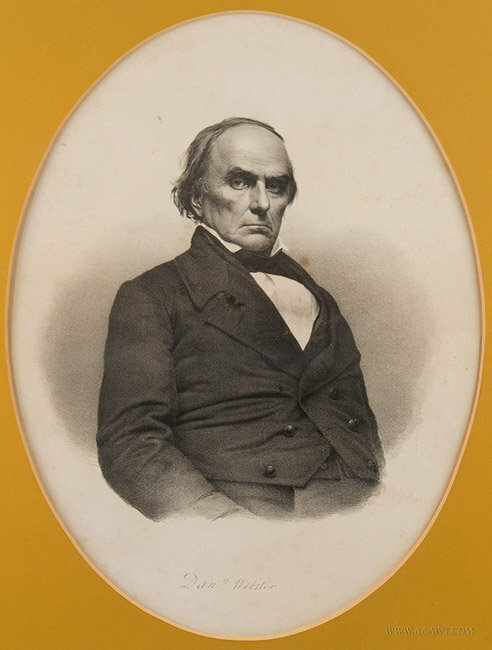 (The artist, a German born painter, came to America in 1848; he exhibited at the national Academy and the American Art Union. 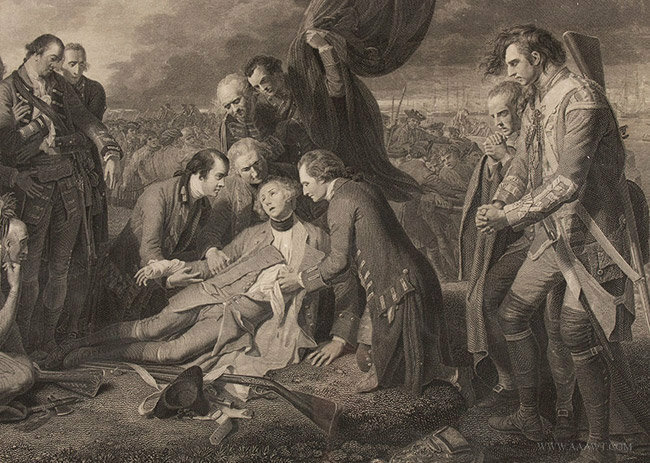 The artist intent was to move the viewer of this monument of American history compelling emotional participation; graphic justification for the fight to preserve the nation; the Civil War. 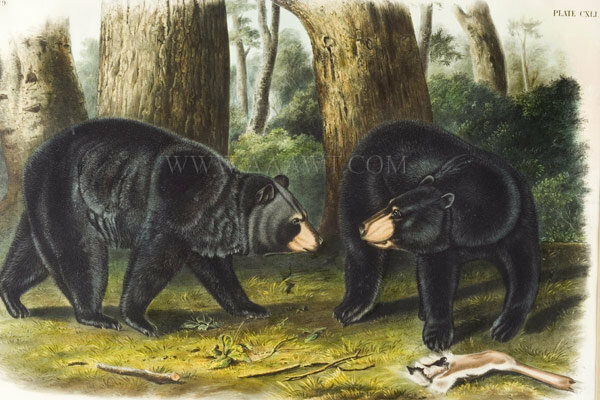 The print is strong and has been professionally mounted, the margins are trimmed, some staining with all else very good. We assume that the outstanding bass-relief frame with mounted ornamentation was carved specifically for this work by a skilled artist. Centering the frame are borders of bullets, stars and a rectangular laurel wreath tied at the bottom with a bow displaying 1492-1620; larger three-dimensional stars are mounted at the corners; surmounting the work is a US shield; at the bottom is a scroll carved with Geo. 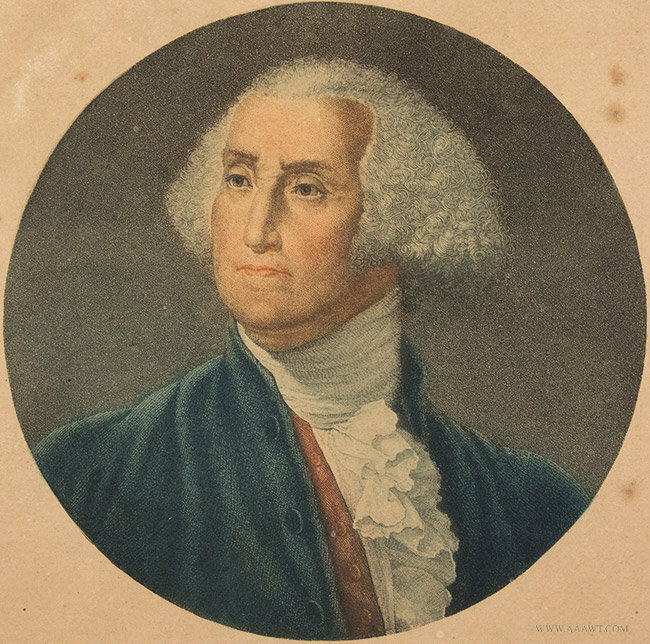 Washington's name and 1776. 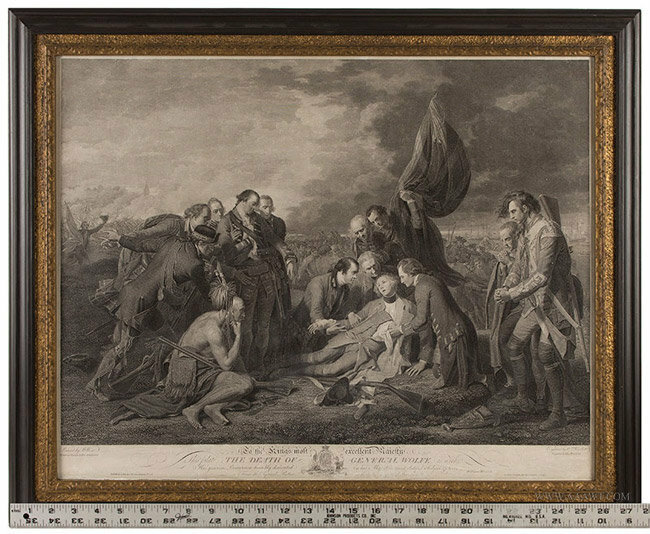 The frame has an applied molded outside edge and gilt liner; gilt has thinned to silver. 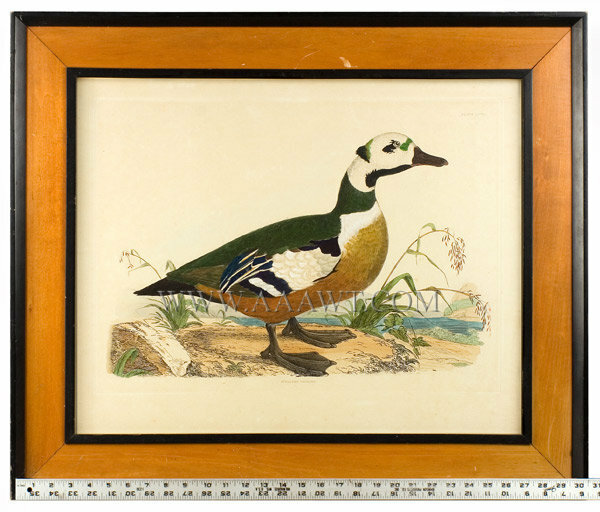 Dimensions: 37.75 by 48.75" frame, 23.5 by 34.5" sight-size. Color lithograph on two pieces of paper signed in the right lower corner "School of Emmy Zweybruck Prochoska Vienna, Helli Fritz aged 15 years." The lower left reads "Secession Ges.m.6. Wein, VIII./2. Tiger 9.17." Dimensions: sight size 19 by 68 inches. 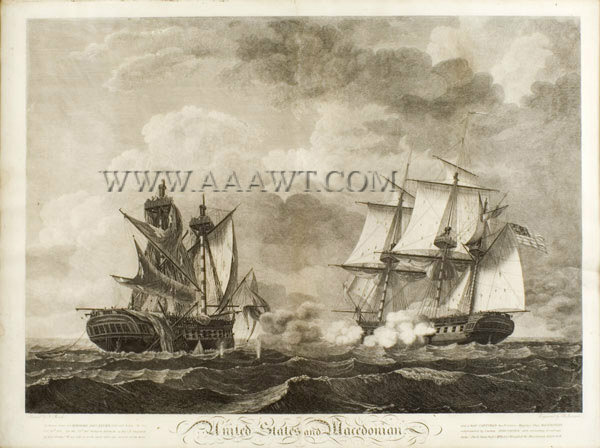 Large engraving depicting the defeat of the Macedonian by the United States in October, 1812 by Philadelphia engraver Benjamin Tanner, after Thomas Birch's painting titled United States and Macedonian with six lines of Commodore Perry's official letter. 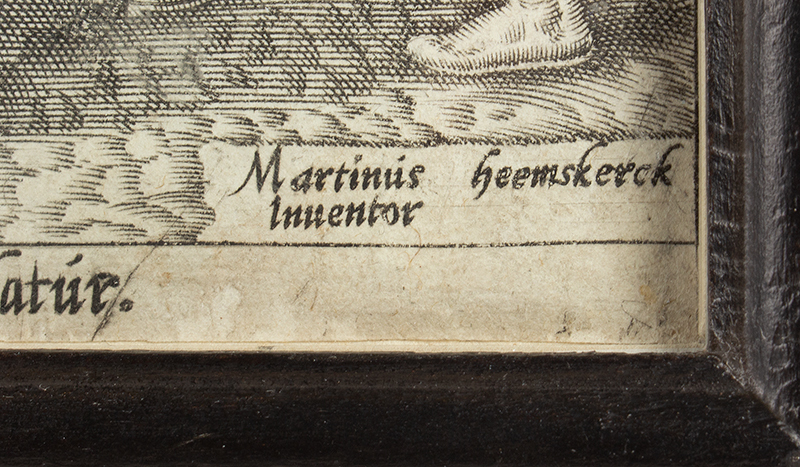 We note that there are margin tears, none are distracting; one at top center; four at outermost left margin that were long ago repaired, and one at right margin extending about one-inch into print; there is a crease at upper left. 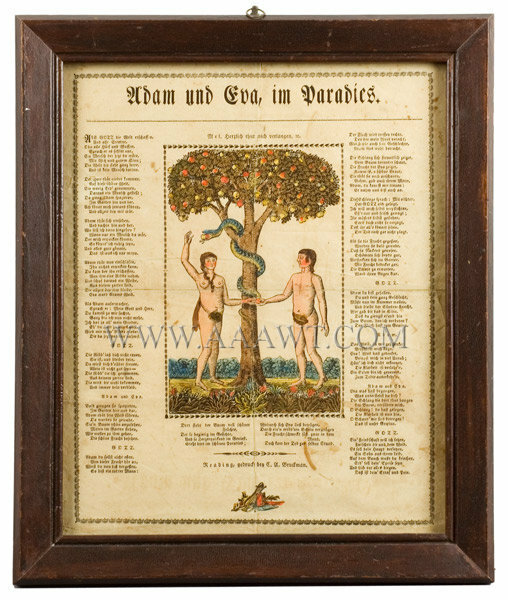 The work is mounted within an oak frame with gilt liner of the nineteenth century. Affixed to the backboard is a very old "granny" note describing the piece and stating who would inherit the work. 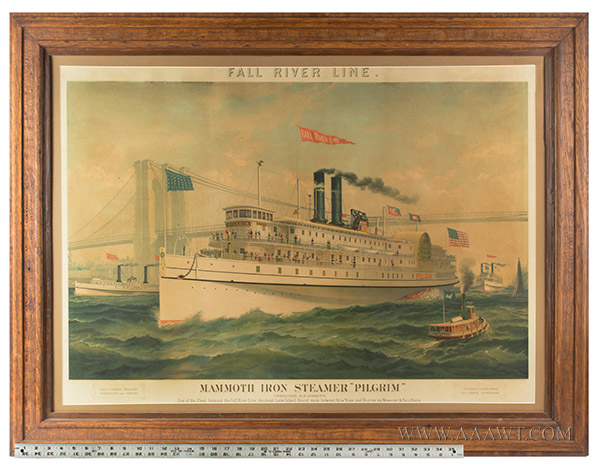 (Frame: 24.25 by 31.25 inches; view: 19.5 by 26.5 inches. 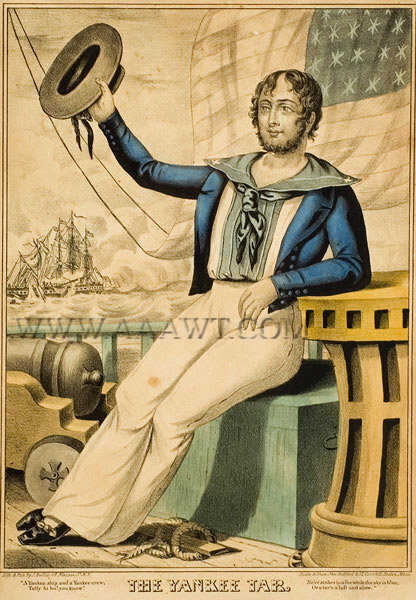 Lithograph titled "The Yankee Tar" published by J. Baillie of New York, highlighted in blue, in period frame, toning, foxing, and tears on outermost edge. Dimensions: 15.5 by 11.75-inch frame, 13.5 by 9.75-inch sight-size. 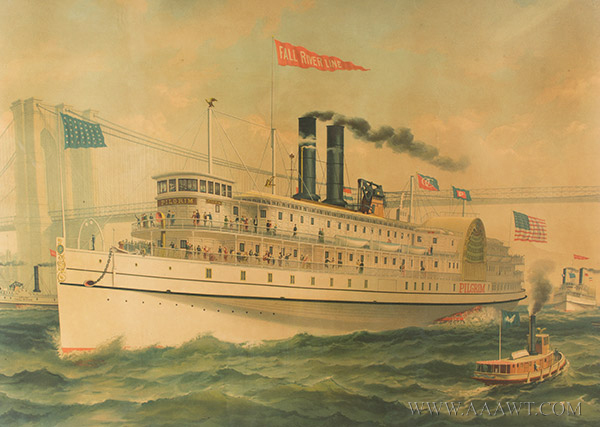 "From the Original Picture in the Collection of John & Josiah Boydell. 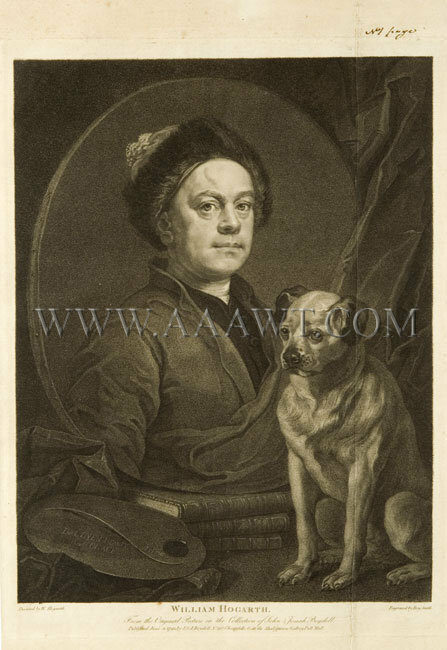 This engraved portrait of Hogarth is from a 1795 collection of the artists prints. 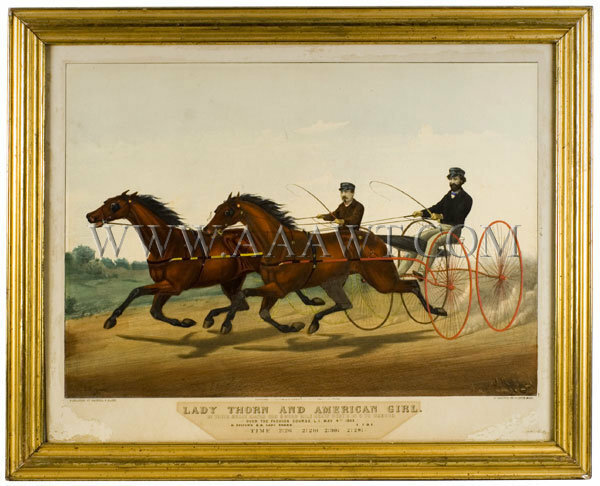 As depicted, famous fast mares, acknowledged rivals of the American trotting turf, are to be afforded an opportunity of deciding the disputed question of superiority of speed on Long Island. Mr. CHAMBERS, of the Fashion Course, has offered a purse of $2,500 for a race between them". Long Island, NY, May 4th, 1869. Good color with traces of old glue residue on margin; toning in area of title-both imperfections resultant of matt, now removed.